Kathy is an environmental chemist and research leader for the Agriculture and Environment Research Unit. She joined the University in 1995 and established AERU soon after. Kathy became a Professor in 2014. Kathy's main areas of interest include environmental management of agriculture, horticulture and land-use, in particular environmental pollution from chemical inputs and the impacts arising from agricultural processes taking a whole farm perspective. She is also involved in the development of techniques to encourage a more sustainable agriculture including the socio-economic aspects, rural development, policy issues, environmental labelling and green taxes. Kathy's work covers a wide spectrum of topics including pesticides, nutrients, waste and resources and biodiversity, particularly with respect to climate change and rural development. This has evolved over the years to cover the entire farm to fork production chain particularly with respect to policy development. Kathy is a Fellow of the Institute of Analysts and Programmers (FIAP) and a Member of the Institute of Environmental Management and Assessment (MIEMA). 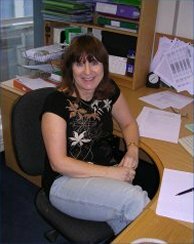 Kathy's first degree in environmental chemistry with computer science was awarded by the Council for National Academic Awards (CNAA), and her PhD in agricultural best practice and was awarded by the University of Hertfordshire. Before joining the University of Hertfordshire, Kathy spent 23 years at Warren Spring Laboratory and 1 year in Industry working as an Environmental Manager. Prof. Kathy Lewis's extended publications list.